Are You an L4L Leader? To date, there have been 6 groups of #Layups4LifeLeaders who have gone above and beyond in helping us raise vital funds for cancer research and clinical trials. Below are examples of how L4L supporters became leaders with the events they put together or with donations they made. Supporter & participant power couple Alissa Treible & Kevin Ryan hosted an ‘Out of this World’ Halloween birthday party and fundraiser at the Laundromat Bar in Morristown, NJ where a portion of each ticket was donated to Layups 4 Life! There were 80+ attendants and they raised over $1,000! Co-Founders Dana & Dan Exter dressed as Eleven & Chief Hopper from the Netflix show ‘Stranger Things’. Their french bulldog Sonny was an Eggo waffle! Law firm Mandelbaum Salsburg hosted a ‘Denim Day’ in support of Layups 4 Life raising $600! West Morris high school seniors, Sam Kahn and Anthony Grauso initiated a fundraiser as a Service Learning Project selling custom ‘L4L’ headbands! They were sold for $5 each to participants at basketball camps throughout the summer and raised $300! @rallysocialsports hosted a charity basketball tournament in the summer of 2018. The winning team, Dream Team, donated $150 in their name to Layups 4 Life! Long time supporter Scott Spector launched a fundraising campaign on Facebook for his birthday and raised $300 benefitting L4L. 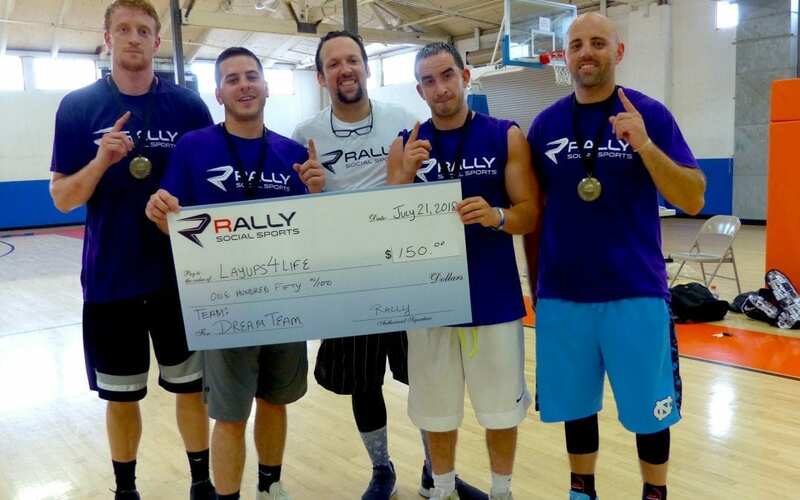 Team Run ‘N Gun from the @njplaysports basketball league donated their team’s $100 winnings to Layups 4 Life! Shoutout to Matt Tobin (@mtobin15) & his teammates @mdubs15 @zachfrick5 @alminjoy31 @jakemelville1 @brandon_zaleski @tone_two3 for their generosity and congrats on the win!! If you or a friend has a fundraising idea to support Layups 4 Life let us know! Are you interested in building your own fundraising page in support of Layups 4 Life? Email Dan at layups4life@gmail.com or direct message us on Facebook or Instagram and we can help you get started!